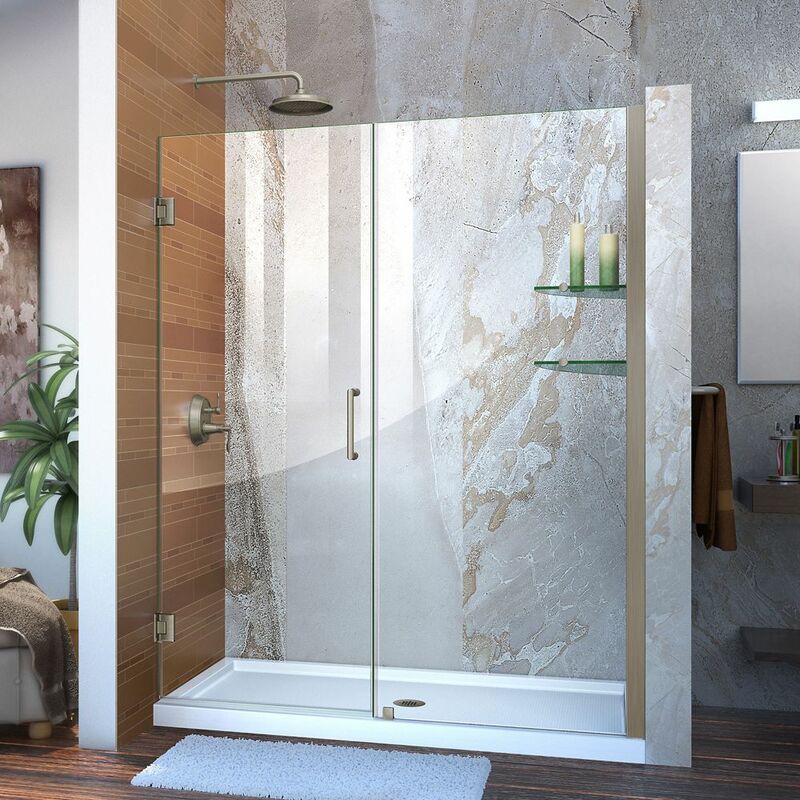 The DreamLine Visions shower or tub door offers breathtaking style for your shower area. Visions features a unique design with dual sliding doors flanked by stationary glass panels to create an ample center point of entry. The Visions glides smoothly on sleek top and bottom rails, while the exclusive fast-release wheels make cleaning the glass and track a cinch. Transform your bathroom with the unique style of the Visions door for a beautiful balance of functionality and elegance. Q-Wall Backwall kits are a great alternative to expensive tile and will add a modern look with an attractive pattern and glass shelves. Q-Wall Backwalls are made of durable, easy to maintain acrylic and can be trimmed during installation to fit your tub space. The Visions tub door and Q-Wall Backwall kit provides the ultimate solution to your shower project! Unidoor 58-inch to 59-inch x 72-inch Frameless Hinged Pivot Shower Door in Brushed Nickel with Handle is rated 4.8 out of 5 by 12. Rated 5 out of 5 by Anonymous from Product was easy to install. Concise directions. Definitely a 2 person installation. Glass doo... Product was easy to install. Concise directions. Definitely a 2 person installation. Glass doors are heavy and ackward. Rated 5 out of 5 by JD from The product was well designed for installation.As a contractor I would recommend and use this pro... The product was well designed for installation.As a contractor I would recommend and use this product again. Rated 5 out of 5 by HomeDepotCustomer from Looks great!... Looks great! Rated 2 out of 5 by Anonymous from The Glass Door and the Glass Panel were different sizes... The Glass Door and the Glass Panel were different sizes and could not be installed so the top of the door and the top of the matching panel were even. It was installed per the directions by a professional installer.